I keep this template simple and neat. It will give a professional look to your blog. Its a browny template with 3 columns and 2 columns both. I’ve not added any useless plugins to this template. Only read more plugin is added as it is the most required plugin for blogs. NOTE : This template is available for free of cost. The only thing that I want in return is, please do not remove the credits from the footer. You doing great man, Like this I’m sure you can make a great list of premium blogspot themes. DO consider it. Thanks for informing. I’ll reupload the images to other server and will also provide images separately. 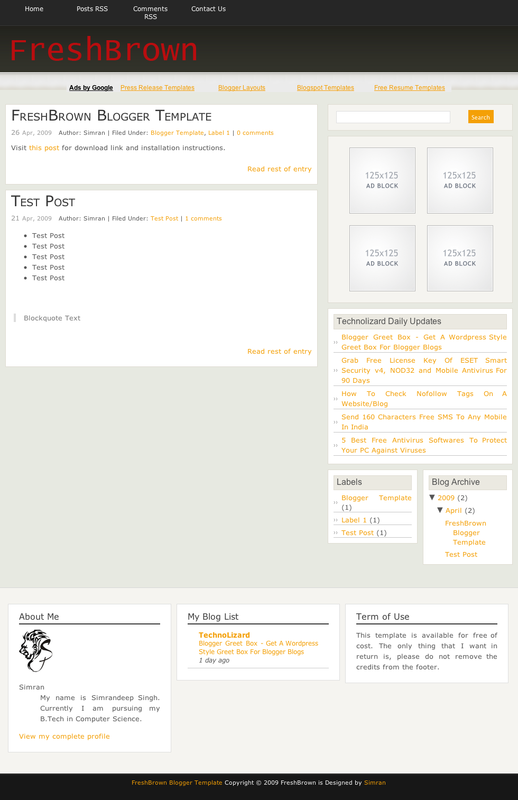 Its really a nice blogger template. I hope this is one of better brown templates. So i have featured this template in my new BloggerUser blog. i hope you will like it. Thanks, I’m using it now! 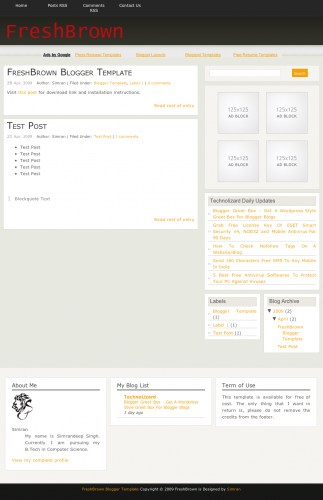 Shafarâ€™s last blog post..Free Premium Magazine Style Blogger Template! Hey, I have a question. How can I replace the 468×60 pic with an adsense banner, inside the posts? .-= Rommel´s last blog ..No to CONASS =-. and replace it with your adsense code. But you have to convert your adsense code before using it in your template. You can use this tool – to convert the adsense code. I can’t find the tinypic link in the template. That’s actually my problem/. 4) Now replace this code with your adsense code. hi there. i really like this template! i want to use it. but how can i change the FreshBrown in the header to be the title of my blog? please let me know… i hope you’ll respond. thanks. I’ve used the image in the header for FreshBrown title. To change that to your own image, find this code – and replace it with your own url. This is really an awesome tempalte. I need this template for my blogger blog. Really a good job publishing this template. Thanks a bunch! .-= Rodolfo´s last blog ..Mis impresiones de The Beatles Rock Band. =-. wow nice sharing thanks for it. .-= solanki´s last blog ..How to make Impressive Presentation With MS-PowerPoint =-. This is very clean template. Thank you friend it is really very nice one. Got the following error from winrar when I tried to download using chrome. I tested the download link and its working fine. I think there is a problem in your winrar or internet connection. Try to download the file again. And look just to the left of the Search box, you’ll see the “Newer Posts” and “Older Posts” links hiding behind the post. Was there some kind of template image that you changed or deleted that caused this? Can you tell me what I need to do to reposition those links? .-= Steve J´s last blog ..Ed’s Roadhouse Jerky – Raspberry Habanero =-. .-= Steve J´s last blog ..Mark’s Meat Co. – Lemongrass Teriyaki =-. I didn’t get the time to fix the bug. I’ll update it soon. BTW, I noticed this problem exist on any blog template that publishes snippets (Read more) on the main or archive pages. Templates that publish full posts don’t have this bug.